RPE replacement for the treatment of age-related macular degeneration (AMD) and other blinding diseases has been long sought-after, as it may be curative (1-6). The RPE is a monolayer of cells located in the back of the eye, involved in maintenance of the neural retina (7, 8). RPE dysfunction causes vision loss in several diseases including AMD, which is the most common cause of blindness in industrialized nations (9). The retina is recognized as an attractive first-target for central nervous system (CNS) cell replacement as it has excellent surgical access and there are sophisticated in vivo monitoring tools. Hence, transplantation of the RPE has become the testing ground for stem cell transplantation and for therapy of neural diseases. Clinical trials were initiated in which human embryonic stem cell (hESC) derived RPE cells are being transplanted as a cell suspension subretinally for the treatment of AMD and Stargardt's disease (Clinical Trial ID# NCT01344993, NCT01226628). Initial reports (10) seem positive in terms of safety; their efficacy is still under review. While hESC- and iPSC-derived RPE are widely appealing cell sources, here we introduce the adult human RPE stem cells (RPESC) as a potential alternative and test their survivability in a rabbit transplant model. Whether transplantation of a RPE cell suspension will re-establish an effective RPE monolayer is debated. If this fails to occur, the therapeutic effect of the transplant might be largely trophic. To more completely restore RPE function, we sought to determine if RPE cells transplanted as a patch of differentiated epithelium on a suitable carrier can survive and maintain cell polarity in vivo. 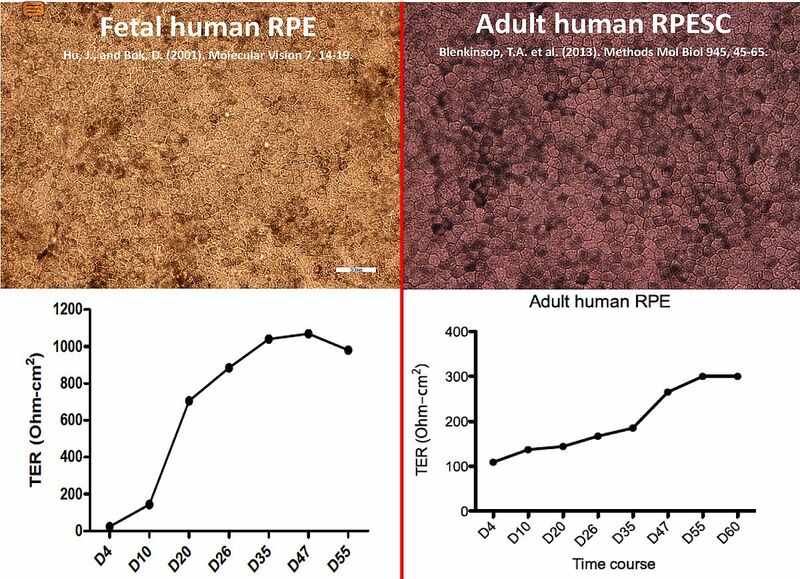 In this study, we first show we can culture RPE from human fetal and adult donor eyes and grow them into their physiologic state on biostable porous polyester membranes (PET). The fetal cultures were generated in Germany, whereas the adult cultures were generated from RPESCs in the USA (11). The latter were then shipped to Germany as live cells. 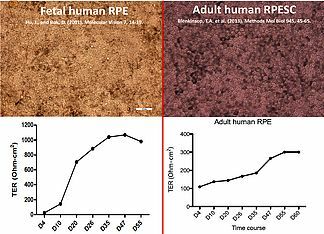 The polarity of the fetal and adult RPE cultures was confirmed by measuring transepithelial resistance, and assaying polarized protein expression immunohistochemically via confocal imaging. Using our previously established surgical technique (19), we then show that we are able to successfully transplant human RPE attached on PET carriers into rabbit subretinal space. The xeno-RPE transplant survives over 4 weeks and therefore seems to evade destruction, consistent with reports of the immune privilege of RPE monolayers (12, 13). Finally, we show that the RPE transplant maintains polarity, is not tumorigenic and does not hyper-proliferate. By contrast, human RPE cell suspension transplants xenografted into rabbit or rat are entirely destroyed by the immune system within 1-2 weeks (14, 15). 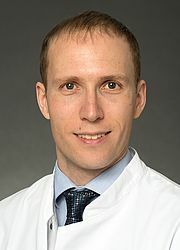 Our results demonstrate we have solved many of the current roadblocks towards clinical RPE monolayer transplantation including: cost-efficient large-eye preclinical animal models, improved survivability of a RPE transplant, preservation of RPE transplant polarity in vivo, use of adult human RPE from cadaver donors (a source possessing the added benefit of HLA matching or autologous grafting), and transport of polarized RPE monolayers internationally. 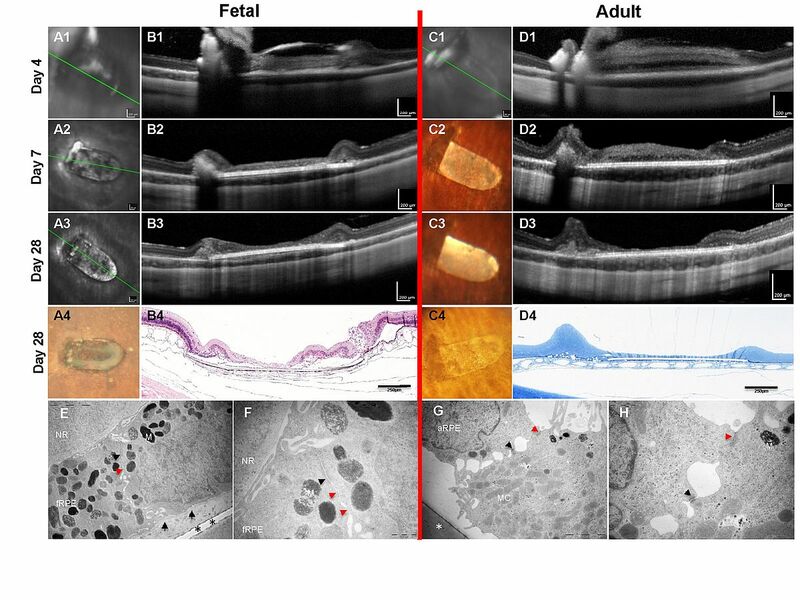 To the best of our knowledge, our work represents the only recent large-eye animal model with carrier-supported RPE monolayer grafts, as other publications utilized rodents and/or suspension transplants (15- 18). Binder S, Stanzel BV, Krebs I, Glittenberg C. Transplantation of the RPE in AMD. Prog Retin Eye Res. 2007;26(5):516-54.
da Cruz L, Chen FK, Ahmado A, Greenwood J, Coffey P. RPE transplantation and its role in retinal disease. Prog Retin Eye Res. 2007;26(6):598-635. Del Priore LV, Tezel TH, Kaplan HJ. Maculoplasty for age-related macular degeneration: reengineering Bruch's membrane and the human macula. Prog Retin Eye Res. 2006;25(6):539-62. Epub 2006/10/31. Gouras P. Transplantation of the retinal pigment epithelium. In: Marmor MF, Wolfensberger TJ, editors. The retinal pigment epithelium. New York; Oxford: Oxford University Press; 1998. p. 492-507. Lund RD, Kwan AS, Keegan DJ, Sauve Y, Coffey PJ, Lawrence JM. Cell transplantation as a treatment for retinal disease. Prog Retin Eye Res. 2001;20(4):415-49. Blenkinsop TA, Corneo B, Temple S, Stern JH. Ophthalmologic stem cell transplantation therapies. Regen Med. 2012;7(6 Suppl):32-9. Epub 2012/12/19. Strauss O. The retinal pigment epithelium in visual function. Physiol Rev. 2005;85(3):845-81. Sparrow JR, Hicks D, Hamel CP. 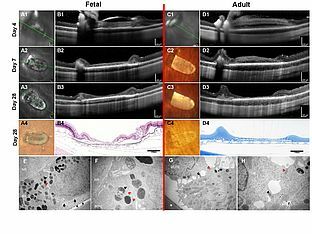 The retinal pigment epithelium in health and disease. Curr Mol Med. 2010;10(9):802-23. Epub 2010/11/26. Lim LS, Mitchell P, Seddon JM, Holz FG, Wong TY. Age-related macular degeneration. Lancet. 2012;379(9827):1728-38. Epub 2012/05/09. Schwartz SD, Hubschman JP, Heilwell G, Franco-Cardenas V, Pan CK, Ostrick RM, et al. Embryonic stem cell trials for macular degeneration: a preliminary report. Lancet. 2012. Epub 2012/01/28. Salero E, Blenkinsop TA, Corneo B, Harris A, Rabin D, Stern JH, et al. Adult human RPE can be activated into a multipotent stem cell that produces mesenchymal derivatives. Cell Stem Cell. 2012;10(1):88- 95. Epub 2012/01/10. Streilein JW, Ma N, Wenkel H, Ng TF, Zamiri P. Immunobiology and privilege of neuronal retina and pigment epithelium transplants. Vision Res. 2002;42(4):487-95. Sugita S. Role of ocular pigment epithelial cells in immune privilege. Arch Immunol Ther Exp (Warsz). 2009;57(4):263-8. Epub 2009/07/02. Gabrielian K, Oganesian A, Patel SC, Verp MS, Ernest JT. Cellular response in rabbit eyes after human fetal RPE cell transplantation. Graefes Arch Clin Exp Ophthalmol. 1999;237(4):326-35. Epub 1999/04/20. Carr AJ, Vugler AA, Hikita ST, Lawrence JM, Gias C, Chen LL, et al. Protective effects of human iPS-derived retinal pigment epithelium cell transplantation in the retinal dystrophic rat. PLoS ONE. 2009;4(12):e8152. Krohne TU, Westenskow PD, Kurihara T, Friedlander DF, Lehmann M, Dorsey AL, et al. Generation of Retinal Pigment Epithelial Cells from Small Molecules and OCT4 Reprogrammed Human Induced Pluripotent Stem Cells. Stem Cells Translational Medicine. 2012;1(2):96-109. Hu Y, Liu L, Lu B, Zhu D, Ribeiro R, Diniz B, et al. A novel approach for subretinal implantation of ultrathin substrates containing stem cell-derived retinal pigment epithelium monolayer. Ophthalmic Res. 2012;48(4):186-91. Epub 2012/08/08. Li Y, Tsai YT, Hsu CW, Erol D, Yang J, Wu WH, et al. Long-term safety and efficacy of human-induced pluripotent stem cell (iPS) grafts in a preclinical model of retinitis pigmentosa. Mol Med. 2012;18:1312-9. Epub 2012/08/17. Stanzel BV, Liu Z, Brinken R, Braun N, Holz FG, Eter N. Subretinal delivery of ultrathin rigid-elastic cell carriers using a metallic shooter instrument and biodegradable hydrogel encapsulation. Invest Ophthalmol Vis Sci. 2012;53(1):490-500. Epub 2011/12/15.